A gun attack on a PSNI patrol in west Belfast has been claimed for the ‘new IRA’ amid a series of alerts and incidents attributed to the breakaway IRA groups. 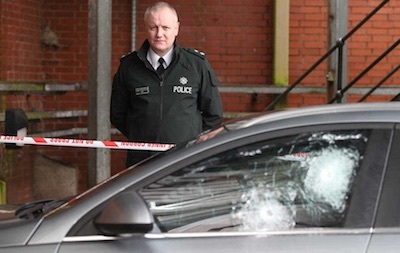 Several shots were fired on Thursday night into the side of an armoured PSNI car in the Rosnareen area of Andersonstown, but failed to penetrate the bulletproof vehicle. Two PSNI men in the car were uninjured but were described by the force as “badly shaken”. Last month the same organisation claimed responsibility for placing a bomb under a van used by an off duty British soldier in north Belfast, but which failed to explode. In comments to a Belfast newspaper, the ‘new IRA’ reportedly said that it will attack members of the Crown forces “if any opportunity arises”. The PSNI said it was fortunate the gun attack took place while its men were inside the vehicle. It is understood that PSNI members had been at Rossnareen Avenue for a number of days conducting inquiries about an unrelated attack on a member of the Travelling community. PSNI Chief Superintendent Nigel Grimshaw (pictured) said only the armoured plating and bulletproof glass had saved the lives of his men. Following a British-Irish Council summit in London, the shooting was condemned by First Minister Peter Mr Robinson and Deputy First Minister Martin McGuinness. McGuinness linked the attack to two highly controversial killings earlier this year which were blamed by the PSNI on a dispute among former members of the Provisional IRA. He said: “I want to join with Peter in unreservedly condemning those who last night attempted to kill two police officers in West Belfast. We have seen people like that involved in the murder of two people in East Belfast. Last week, a separate IRA group known as Óglaigh na hÉireann claimed responsibility for a bomb directed against British soldiers in the County Derry area. A controlled explosion was later carried out on the device at Legavallon Road at Drumsurn, near Dungiven. The attack is believed to have followed the emergence of video footage of British soldiers openly patrolling in the area. In a statement to a Derry newspaper, Óglaigh na hÉireann said the Drumsurn device had been ignored by the RUC/PSNI until recently, despite previous warnings. It also claimed responsibility for a mortar and a gun attack in the Currynierin area of Derry earlier this year and a mortar attack in Strabane, County Tyrone. A ‘viable device’ found in an alert near Feeny in County Derry this week is also being attributed to ONH. There were also two overnight hoax alerts at Strand Road PSNI station and at Thiepval Army barracks in Lisburn, County Antrim on Thursday night. In its statement, the ‘new IRA’ said recent events had shown that claims that militant republicans are heavily infiltrated are untrue. It was responding to allegations that some incidents attributed to the breakaway IRA groups are being orchestrated by MI5 or other British agencies. While the British security forces have avoided serious injury at the hands of the IRA groups in recent years, ‘punishment attacks’ against alleged drug dealers have continued, sometimes with fatal consequences. The latest such attack took place in the Brandywell area of Derry on Monday night, in which a 23-year-old was shot in the upper legs at his home. “They dragged him from the living room to the hall and opened the front door and let everybody see him. Everybody thought he was dead,” his distraught mother said.